A Mojave rattlesnake prepares to strike. : image credit & copyright: Wolfgang Wüster What was fast-becoming received wisdom among herpetologists, namely that snake venom composition normally reflects the variety of their prey, has been disproved in one common species of North American rattlesnake. 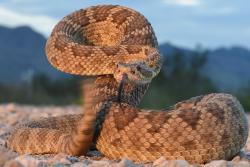 New research by an international team led by Bangor scientists Dr Giulia Zancolli (now at the Swiss Institute of Bioinformatics) and Dr Wolfgang Wüster of the University's School of Natural Sciences, and published today in Proceedings of the Royal Society B, has disproved this assumption in the North American Mojave rattlesnake, Crotalus scutulatus, and has reopened the debate on what drives the evolution of diverse venoms in snakes. Across their range, different populations of Mojave rattlesnake display two distinct venom types: neurotoxic venoms, termed “Venom A”, which cause paralysis, or haemotoxic venoms, termed “Venom B”, which cause local tissue damage and bleeding. The neurotoxic venoms can be as much as ten times more lethal than the haemotoxic venoms, despite populations with varying venom types living within fairly close proximities to each other. While seeking to understand in greater depth the reasons behind this spectacular venom variation within this one common species, what the researchers found, or rather, did not find in this case, was the expected correlation between diet and snake venom types. Neither did they find a correlation between venom variety and the genetic divergence of different populations within the same species. 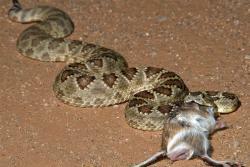 A Mojave rattlesnake eats its prey. : image credit & copyright: Wolfgang Wüster “We expected to find that the distribution of the different venom types would reflect what prey the snakes eat in different places. Instead, what we found was that the venom variation matched environmental factors such as climate and vegetation much more closely.” explains Dr Wolfgang Wüster of Bangor University’s School of Natural Sciences. Giulia Zancolli added: “What I found particularly fascinating is the way our study was able to bring to light how in nature there are barriers that impose strong selective pressures, but which are not obvious to our eyes. It is only with comprehensive sampling and looking at many different factors, like diet, genetics and environment at the same time that we can start to capture them”. The research was funded by a Leverhulme Trust Grant, a Santander Early Career Scholarship and a Spanish Government Ministerio de Economía y Competitividad Grant. It included contributions from Bangor University, CSIC, Valencia, Spain, San Diego State University, Cornell University, Loma Linda University, Aberystwyth University, University of Arizona, Arizona State University, University of Texas at El Paso and Seattle Central College.